Want relief from high taxes, cold weather and a fast pace? This comfortable, spacious home is within thirty minutes from downtown Greenville, SC, Clemson and Furman Universities, GSP International Airport, mountains and lakes!! Designed by the original owners and current Sellers, this one-of-a-kind home embodies convenience and functionality. 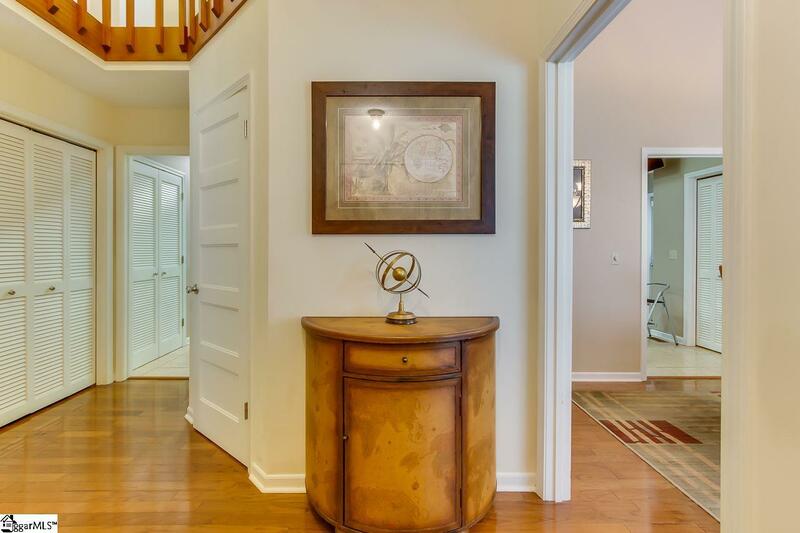 Situated on a terraced hill overlooking the 16th Fairway in Smithfield's Subdivision, this home combines an easy location with a woodsy, mountain feel. A stacked stone turret invites you across a unique footbridge to the front door. The over-sized family room with vaulted ceilings flows effortlessly into the large kitchen. The 22 foot island, complete with a raised bar that seats six, is the perfect social hub for everyday family activity to larger gatherings. There are miles of Shaker cabinets dressed with simple clean lines, pull-out drawers, and four extra wide drawers for all those odds and ends! A built-in warming drawer, wall oven and microwave offer multiple cooking options for the chef of the family. Flowing from the kitchen is a nicely sized dining room, large enough to hold your heirloom family pieces and a Thanksgiving crowd! Back in the great room, a stacked stone wall provides a backdrop for a free standing wood-burning fireplace. An upstairs footbridge leads to a cozy loft overhead and two large bedrooms, perfect for grown children or friends coming to visit. 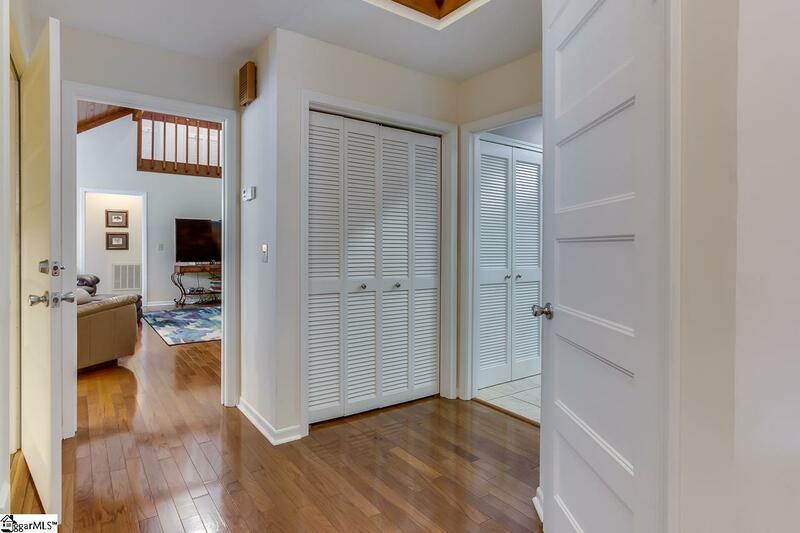 Each bedroom includes a large closet with built-in shelving and a private full bathroom complete with a laundry chute that drops right into the laundry room below!! Back on the main floor you will find the wrap-around master suite. Features include large closets, hardwood floor, ceramic tile floor, and a unique private bath complete with jacuzzi/spa. Located off the master bath is a comfy office that allows you views of the golf course from the oversized windows but a more private office feel from the rest of the home. It also accesses the great room through an opaque barn door! 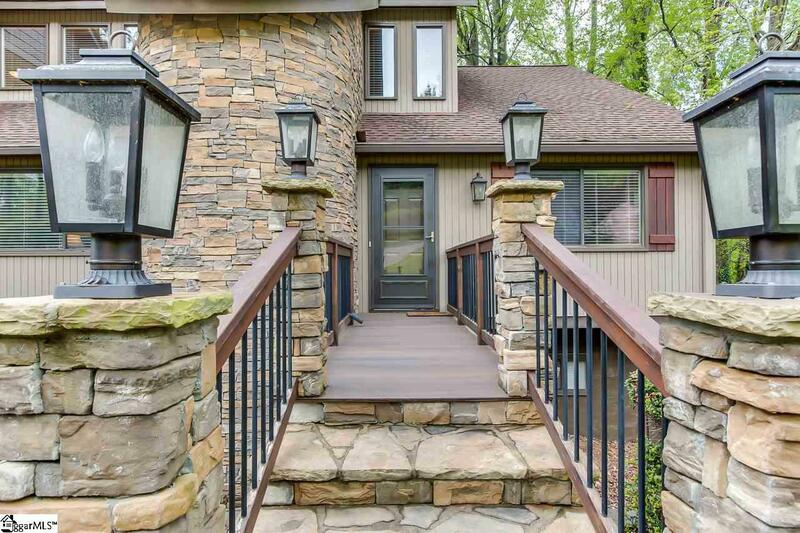 Stepping out to the screened porch, adjacent to the wrap-around deck, one gets that relaxing mountain feel. 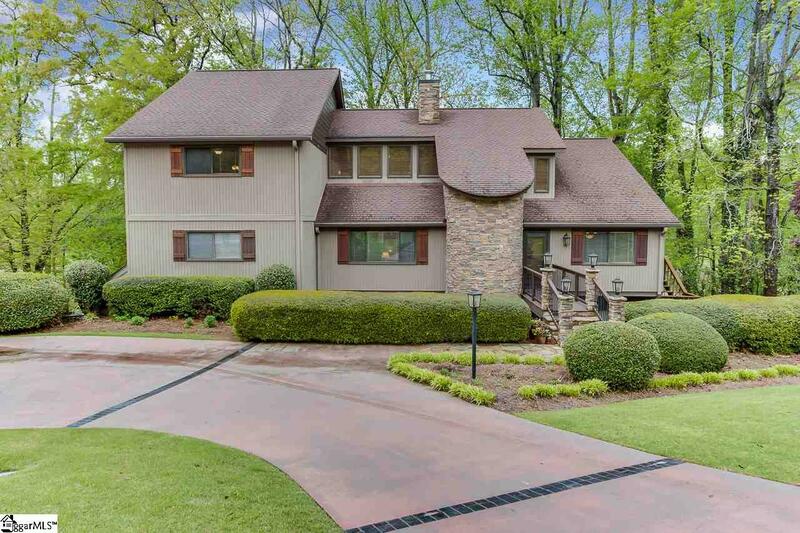 This home overlooks a tree lined backyard with mature azaleas, dogwoods and dozens of hardwood trees. You can easily hear and see the creek below, and peek through the lush green curtain of natural foliage to the golf course. A trip downstairs and into the basement reveals a large daylight multi-purpose room with its own private patio. You have the perfect spot for a Man Cave, an In-Law Suite, an additional bedroom, a rec room, or a home office. Closets line one of the walls, and a full-length counter and cabinets with a wet bar line another, giving you TONS of storage! In addition there are two Murphy beds! The full bath in the basement will come in handy! The three car garage gives you plenty of room for your vehicles. There is even a location for a workshop and over 300 linear feet of shelving, along with overhead storage. Membership at Smithfields Country Club is optional. The Club offers amenities that are reasonably priced and top-notch. Cultural, sports, outdoor, dining, and entertainment opportunities abound in the area, offering everything you might be looking for.